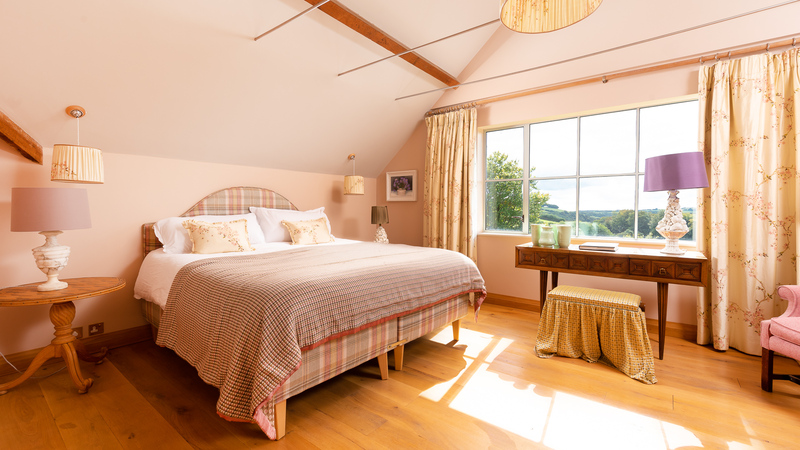 Exmoor Farmhouse is a spectacular 7 bedroom house set high on the hill above Withypool, enjoying far reaching views of Exmoor. The house is also with Europe’s first Dark Skies Reserve and the skies at night are amazing. 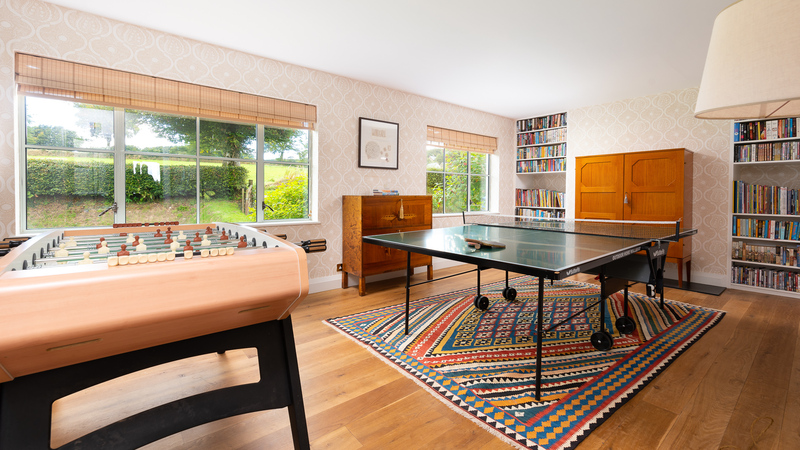 The house can sleep 14 people and takes dogs making it a great place for extended families or a group of friends to enjoy a break away from it all in luxurious surroundings. 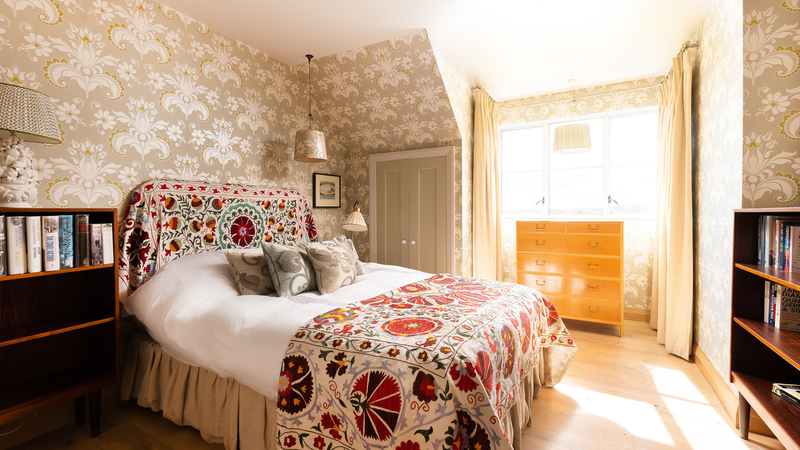 Exmoor Farmhouse is a short walk down the hill to the charming Exmoor village of Withypool, with a great pub, The Royal Oak which serves good food and local ales. The village also has a local shop and post office. There is an ancient six arch bridge over the River Barle, which has a pretty picnic area on the banks of the river. There is also a lovely walk that stretches along the river to Tarr Stepps and Landacre Bridge. 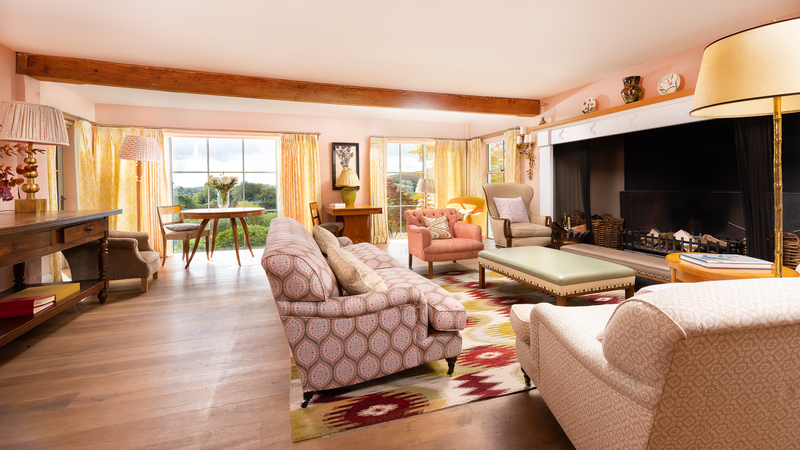 Exmoor Farmhouse is a large 7 bedroom house with underfloor heating throughout and 4 separate fireplaces and four living rooms and surrounded by lovely gardens, so there is plenty of space for everyone to relax in peace and for children to run wild. You enter the house via large entrance hall with hooks for coats and space for muddy boots. There is a handy utility room off the entrance hall which has two washing machines, a tumble dryer, a butler’s sink and airing cupboards. The entrance hall leads to a large, central corridor with an open fireplace and large round table plus doors to the gardens. The kitchen is massive as you would expect in a house of this stature and is full of charm and character as well as being very well quipped with 4 dish-washers, an electric oven and hob and a pantry with large fridge-freezer. There is also a wooden table and chairs for six and an armchair and a fire, all very cosy for relaxing on Winter nights. There is also a door to the rear garden. 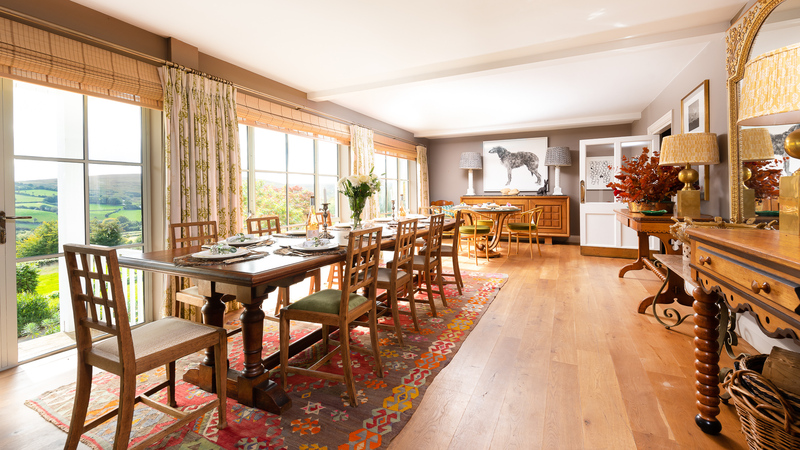 The dining room is off the kitchen and has a large table which seats 10 and another table for four, ideal for children wanting to together. 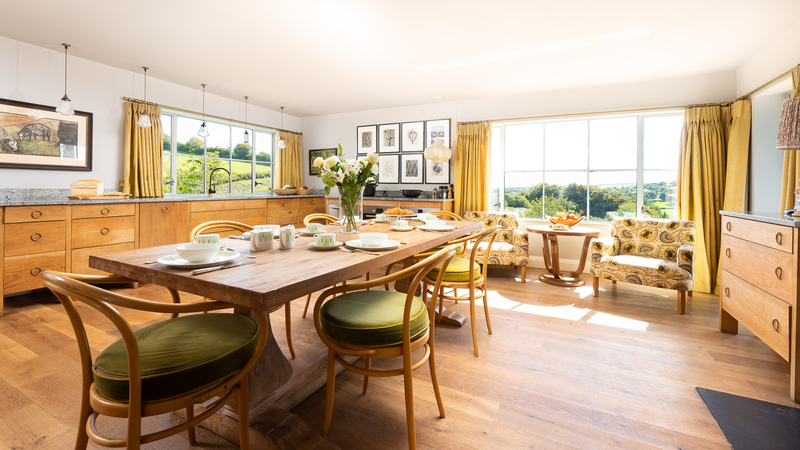 The dining room has floor to ceiling windows and glass doors to the garden and providing fantastic views over Exmoor. The large living room is at the other end of the house and has a massive feature fireplace plus comfy sofas and chairs and two coffee tables. There are also doors to the terrace with table and chairs. 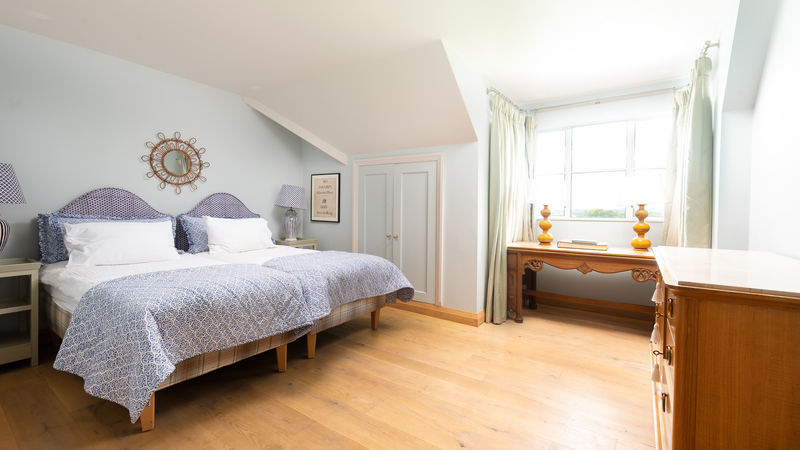 There are three other rooms on this floor; the snug with a large TV and Blue-ray player great for kids to escape. The study with his and hers desks plus a library of books and finally the games room with table-football and table tennis plus loads of board games and a stair-case to the first floor. The main staircase comes off the central hallway and leads to 7 bedrooms and 4 bathrooms. 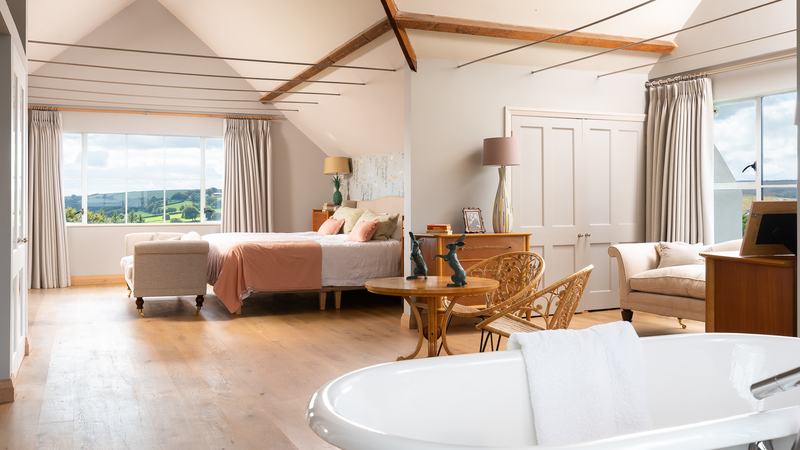 The master bedroom is huge with three areas, one with a king-size bed, the middle area has a sofa and then there is a lovely en-suite bathroom with open roll-top bath and walk-in shower plus washbasin and loo. 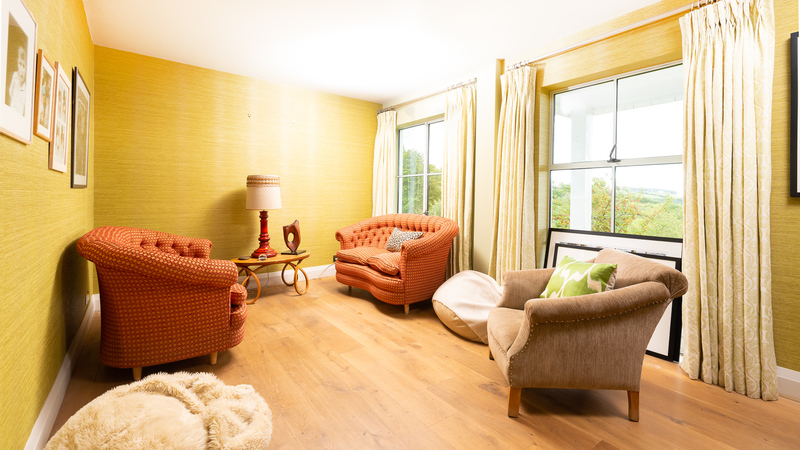 There are another four double bedrooms and two twin bedrooms with full size single beds. There are another 3 bathrooms with a mixture of walk-in showers and roll-top baths. Outside the house is surrounded by gardens that drop down from the house at the front, one even has two goal-posts. To rear of the house there are more gardens and as you go back up the drive you will find the stables. There is a BBQ, tables and chairs and sun-loungers in the top garden.